Break over Voltage: When the gate of the Silicon Controlled Rectifier is open, then the minimum amount of forward voltage which is required for Silicon Controlled Rectifier to start conducting heavily, is known as Breakover Voltage. When the value of forward voltage is less than breakover voltage of SCR then SCR will work as OOF switch and can't conduct. When the value of forward current increases than the breakover voltage it'll break either of the two collector diodes. When this breakdown occurs then the SCR works as a Closed switch or ON Switch. Peak Reverse Voltage: When Cathode Terminal of SCR is kept positive with respect to anode, then the maximum reverse voltage at which Silicon Controlled Rectifier remains in OFF state or doesn't conduct , is called Peak Reverse Voltage. 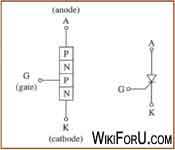 Holding Current: When the gate terminal of SCR is kept open, then the maximum value of anode current at which Silicon Controlled Rectifier is turned OFF from conducting condition, is known as Holding Current. When an SCR starts conducting then it can only be turned OFF by decreasing the supply or anode voltage to zero. In act, at this voltage the two transistors quickly goes to cut-off region and thus stops the conducting of Silicon Controlled Rectifier. At this condition, the value of anode current is very small and is known as Holding Current. Forward Current Rating: The maximum value that an Silicon Controlled Rectifier(SCR) can bear or handle without burning is called Forward Current Rating.